The fourteenth edition of the revival Quarter Ton Cup looks set to produce one of the closest battles seen to date in a class which is famed for its close competition. 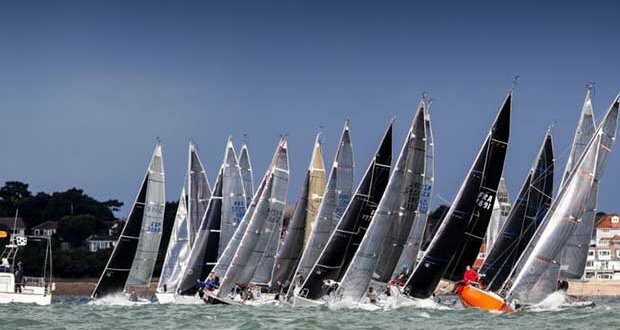 With three days of inshore racing on the Solent from 20 to 22 June, some 25 boats are expected to challenge for this year’s honours. The fleet will be based at Cowes Yacht Haven with the race office located in the Haven’s Solent Room and the après sailing social events, which include a BBQ and the traditional Quarter Ton Cup Prize Giving Dinner, being held in the Haven Event Centre. Racing will be located on the Solent using predominantly windward/leeward courses. The fleet got a taste of the competition to come at the recent Vice Admiral’s Cup Regatta where the Quarter Ton racing was so close that there was a three-way tie for first place between Sam Laidlaw’s Aquila, Louise Morton’s Bullet and Catrina Southworth’s Whiskers, helmed by Ian Southworth. On that occasion Aquila claimed overall victory on count back thanks to her three first places, but the gauntlet has been thrown down and we can expect Whiskers and Bullet to be seeking revenge at the Quarter Ton Cup. This will be the first Quarter Ton Cup in 12 years not sponsored by Coutts, whose most generous support helped the class develop from a small group of friends sailing tired old boats to an enthusiastic fleet of beautifully restored historic yachts which produce some of the most competitive racing you could hope to find. “A twelve-year partnership with any sponsor is an extraordinary achievement and we can’t thank Coutts enough for all they have done. But all good things must come to an end and we are now seeking new commercial partners. We can offer an excellent tailored benefits package and would be delighted to speak with any companies interesting in working with us.” Noted Class Secretary Louise Morton. For further information about this event including the Notice of Race and Entry Form please visit quartertoncup.org. Members of the Press wishing to attend the event should contact Quarter Ton Cup Press Officer Fiona Brown on fiona.brown@fionabrown.com.